The Tremont House, A Wyndham Grand® Hotel, celebrated its first Mardi Gras Ball and grand opening ceremony on Feb. 16, 1985, in conjunction with Galveston’s revival of its citywide Mardi Gras celebration. As the hotel approaches its 30th anniversary in 2015, it plans to revive old practices, pass on current rituals and create new traditions for the future, including special events, giveaways and more. In the early years of operation, the hotel hosted a “Tea tête-à-tête” on weekday afternoons, offering fine herbal teas, finger sandwiches and pastries; one of Texas’ most legendary leading ladies, Lady Bird Johnson, enjoyed afternoon tea at the hotel in 1986. To honor this early tradition and in celebrate its 30th anniversary, Tremont House, A Wyndham Grand Hotel, will revive this event and host afternoon tea on March 8, June 14, Sept. 13 and Dec. 13, 2015. Sunday Afternoon Tea will feature assorted mini salads, tea sandwiches, pastries and sweets and will be served from 3 to 5 p.m. Advance reservations are required and can be made by calling (409) 763-0300. Sunday Afternoon Tea is $40 per person for standard tea service and $50 per person for the option of champagne, mimosas or wine. A limited number of seats are available and an overnight package for Sunday night will be offered. The hotel will also offer a “Craft Beer 101” event June 5-7, 2015, for craft beer enthusiasts. In partnership with Galveston Island Brewing Company, the weekend event will offer an introduction to craft beer that will give novices the opportunity to learn about the basics and differences of craft beer, the art of making beer and beer pairings with food. The weekend package starts at $299 per night and includes accommodations for two for two nights, valet parking, a craft beer talk and tasting on Friday and a brewery tour and beer pairing dinner on Saturday. For details, visit www.TheTremontHouse.com and see special offers. In honor of the hotel’s close association with Mardi Gras, and in memory of hotel owner and 1940 Texas A&M University graduate George Mitchell, The Tremont House, A Wyndham Grand Hotel, will transition its longstanding Mardi Gras Ball to a Mardi Gras Parade Viewing Party benefitting Texas A&M University at Galveston (TAMUG). Mitchell, who has been recognized as the most generous donor in Texas A&M University history, donated the land for TAMUG’s main campus in his father’s name. Now, the George P. Mitchell Society of Texas A&M University at Galveston will be the beneficiary and host of this annual Mardi Gras event, which had been previously presented by George and Cynthia Mitchell and the Mitchell family since 1985. The first “A&M Mardi Gras Parade Viewing and Balcony Party,” underwritten by The Tremont House, A Wyndham Grand Hotel, will be held on Saturday, Feb. 14, 2015. All festivities will be held in the Tremont Ballroom, offering guests a premier view of Galveston’s biggest Mardi Gras Parade. For tickets, visit www.tamug.edu/mardigras. The history of The Tremont House can be traced back to 1839, when the first hotel opened at the corner of Tremont and Postoffice Streets. In celebration of The Tremont House and the Mitchells’ longstanding heritages, the hotel will add an exhibit in 2015 showcasing the three hotels that have borne the Tremont House name, the contributions of George and Cynthia Mitchell to the current hotel’s preservation, and the family’s role in restoring The Historic Strand District in Galveston. The exhibit is free and open to the public. The hotel plans to produce a new audio tour, available in 2015 as a free smartphone app, that will offer a brief history of the hotel and the Mitchells’ role in preserving Galveston’s historic downtown. The tour app will be available in 2015. Additionally, the hotel is working with the Galveston Historical Museum to create an expanded exhibit on The Tremont House and The Strand in the hotel’s lobby. The hotel team encourages guests to share their favorite photos and memories of The Tremont House in 2015, tagged with #TremontHouse, on Facebook and Instagram. Doing so will give guests the chance to win giveaways from the hotel like gift certificates and getaways throughout the year. Additionally, Rooftop Bar patrons will enjoy “Friday Social Club” specials on Fridays from 5 to 7 p.m. beginning in January 2015. The Tremont House, A Wyndham Grand® Hotel, is owned by the Cynthia and George Mitchell family as part of Mitchell Historic Properties. The Tremont House is a 119-room, boutique-style hotel located in the heart of The Strand National Historic Landmark District and Galveston’s Downtown Cultural Arts District. This historic hotel features 14,000 sq. ft. of meeting space, a bistro-style café, fitness center and two bars for entertainment – the 1888 Toujouse Bar and The Rooftop Bar. For reservations, call (409) 763-0300 or visit www.TheTremontHouse.com. Wyndham Hotels and Resorts, LLC, a subsidiary of Wyndham Worldwide Corporation (NYSE: WYN), offers upscale hotel and resort accommodations at more than 180 properties throughout the United States, Canada, Mexico, Central and South America, the Caribbean, Europe, the Middle East and China. All Wyndham® hotels are either franchised by Wyndham Hotels and Resorts, LLC or managed by Wyndham Hotel Management, Inc., or one of its affiliates. Additional information and reservations for all Wyndham hotels are available by visiting www.wyndham.com. Wyndham Hotel Group is the world’s largest and most diverse hotel company, encompassing approximately 7,590 hotels and 655,300 rooms in 71 countries. Additional information is available at www.wyndhamworldwide.com. For more information about hotel franchising opportunities visit www.whgdevelopment.com. 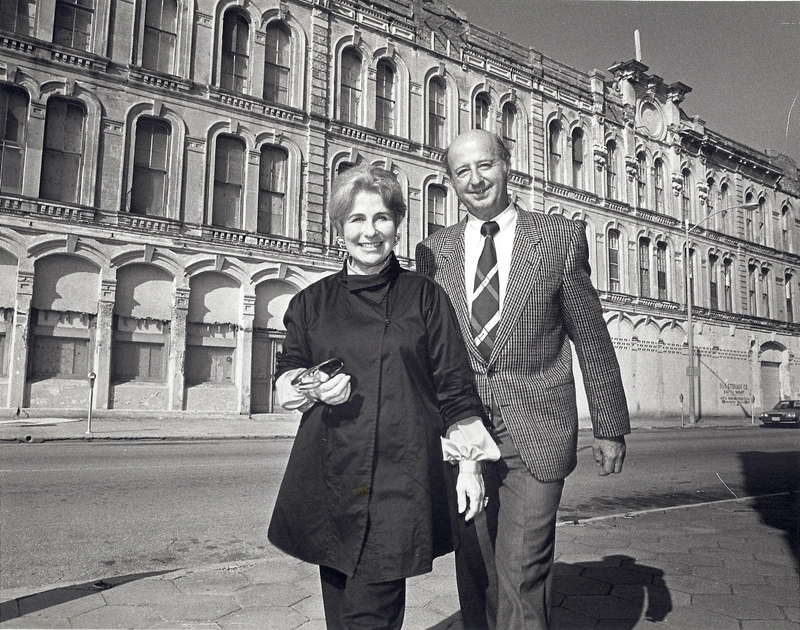 The late Cynthia Wood Mitchell and George Mitchell pictured in front of The Tremont House prior to its restoration. The Mitchells converted this 1879 dry goods warehouse into a hotel named The Tremont House which opened in 1985.